As my time in Florence came to a close, I decided that I wanted to maximize my student visa and stay in Europe as long as possible before they kicked me out. None of my other friends from Syracuse were staying but I decided to go ahead and book a solo, two-week backpacking trip anyway. Why not take advantage, right? The only problem was that I had a teeny-tiny budget and had no idea how to make my time and money stretch as far as possible. For you travelers who need a fantastic vacation and can’t spend a lot, the Greek islands were incredibly affordable and had the best beaches, scenery, nightlife, and opportunities to meet other young travelers. Unlike Italian or Spanish people, most Greek people speak English very well so no worries about the language barrier here. Plus, I felt completely safe the whole time as a young woman traveling alone. Here are the three islands I visited during my trip, to give you an idea of how to construct your own, or visit snoworsand.com to have them book it for you. If you love living in a swimming suit, sipping a pina colada, laying on a beach, coastal hiking, shopping, eating fresh vegetables, meeting people, or getting a tan, I guarantee you won’t be disappointed! This picturesque island is the only one with the signature all-white houses. Mykonos is slightly more expensive than the other islands when it comes to food, drink and lodging because it’s a favorite spot for honeymooners and a slightly older crowd. â€¢ At the port when you arrive on the ferry from Athens look for a representative from Paradise Camping. For 14 Euros a night you can stay in a little wooden house/tent by Paradise Beach. Breakfast is included. Paradise is a huge camping compound where all the younger people go. 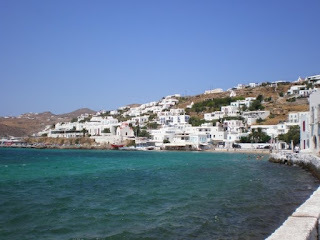 â€¢ Lay on Paradise Beach by day or take a bus to Mykonos town. Hit up the huge Paradise Dance Club located at the back of the camping compound at night. Entry is 13 Euro with a drink before 1AM for Paradise Camping guests. 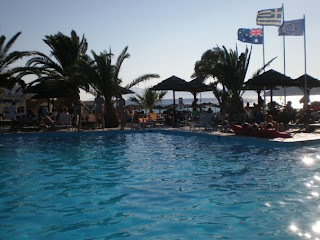 â€¢ In Mykonos town, Scandinavian Bar is good for dancing, or if you like to relax and sit by the Aegean Sea there is an area of bars and cafes called Little Venice. Just watch out for the spray of the waves at night! â€¢ TIP: Mykonos was also the coldest place I went to in Greece. With +100 degrees Fahrenheit temps I mostly brought all the right clothes. This was the only place I wished I had a pair of jeans to wear out at night. 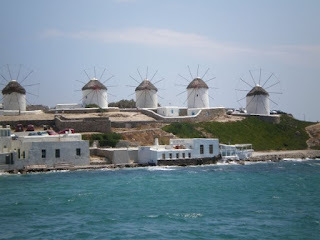 â€¢ Also explore the signature windmills dotting the skyline of Mykonos town. â€¢ Mykonos has cute little boutiques and supermarkets, and even though the winding streets of white houses look very similar, it’s small enough where you can’t get lost too easily. â€¢ For lunch go to any of the gyro places and pick up the traditional Greek sandwich for 2 or 3 euro. Grab a Greek salad for dinner-a mixture of freshly chopped purple onion, green pepper, feta cheese, Greek olives, tomatoes, and cucumber-about 6 Euro. This was my favorite place during the whole trip-I actually changed my itinerary to stay an extra day. If you like water sports, ocean or pool swimming, and a lot of sunning and dancing, definitely stop here. Ios is the cheapest island, so by default it draws the largest crowd of younger people. â€¢ Stay at Far Out Camping. For 10 Euro a night you can have a little wooden house/tent to crash and store your stuff. Far Out is a resort with its own restaurant, pool, waterslides, a couple of bars, and a huge section of beach where you can rent water sport related equipment. â€¢ TIP: Bring a bed sheet for Far Out. I didn’t have one and they don’t provide them so unless you want to sleep on a beach mat, which is also fine, bring a cheap little bed cover. â€¢ At the restaurant get eggs and toast for breakfast for 3 Euro, a pizza or Greek salad for dinner for 6 Euro. Cocktails are 4 Euro and beer is 3 Euro. If you have a super tight budget like I did, hit up the supermarket located right inside the entrance for bread, cheese, fresh fruit and large bottles of water (which you’ll drink like crazy in the heat). â€¢ At nights when the sun goes down, Far Out plays a movie in English projected on a big screen. Afterward people go get ready for the night and take buses into Ios town to explore the bars and clubs. The main section of town is packed with all kinds of bars: some play classic rock, others play jazz or salsa and others play the typical top 40 hits. â€¢ The resort has a pool inside the compound just across the street from the aqua-blue ocean. 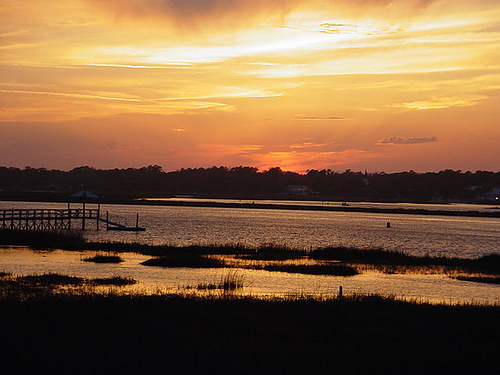 You can rent beach umbrellas or just plop down a towel and lay out. The island you see on all the postcards of Greece. Also, it’s where Sisterhood of the Traveling Pants and several other movies were filmed and with its expansive black sand and red sand beaches, it’s a must see. Santorini sits on a fault line and from the top of the hills you can get great views of the caldera and still-active volcano that created the island. â€¢ Transportation around Santorini is awful if it exists at all so for 15 Euro a day you can rent an ATV or motor scooter. 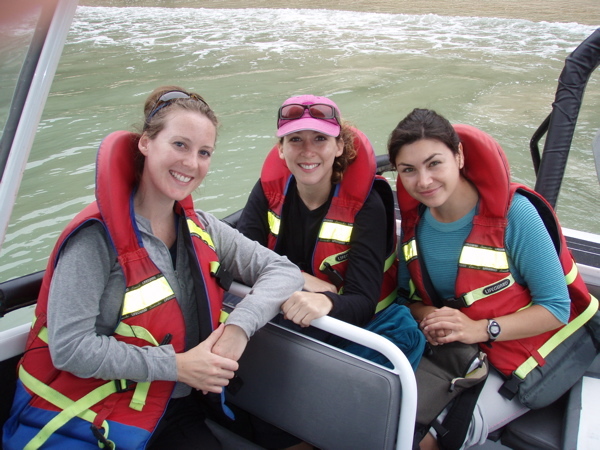 This is a great way to see the beaches and towns that you want to. Just grab a map and go. On my ATV it took me about 40 minutes to get from one side of the island to the other, so when you are driving at night just be extra careful. Like the Italian drivers, Greek drivers are crazy. 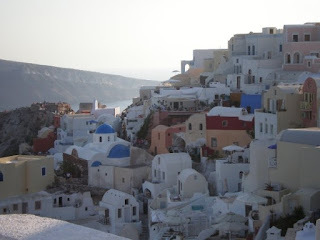 â€¢ Visit Fira, the capital of Santorini. Here you can grab a quick lunch from one of the supermarkets, gas up, check out the cute little jewelry shops, and drive up into the village for a great view of the coasts of the island. Fira is located about halfway up the island. 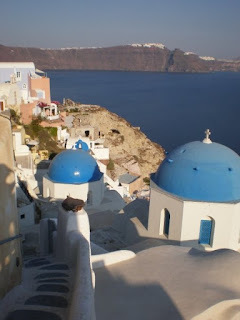 â€¢ Visit Oia (the famous postcard/movie filming city) where you can take a dip in the deep blue oceans at the famous swimming spot or watch the famous sunset from the top of the village. â€¢ Nightlife here is tamer than Mykonos or Ios so grab a bottle of wine or a beer and head to the beach to enjoy the lapping of the waves and a relaxing night. Greece was so incredible that when the time came for me to catch a flight to Barcelona I really didn’t want to leave. Ferry tickets are 30 Euro or less so getting from island to island is easy, and if you want three very different experiences Mykonos, Ios and Santorini offer a great variety of tastes of Greece. If you want to save even more money, bring your own tent and camp at the places I suggested for as little as 2 Euro a night. The Greek sun was the hottest in the Mediterranean so be sure to wear sunscreen, drink plenty of water and allow your body time to adjust. Stay tuned for a Barcelona report and tips! I loved Greece! I "accidentally" stayed for about a month. While the 3 most popular islands in the Cyclades (Ios, Mykonos, Santorini) are great, I would also suggest checking out some of the neighboring islands — Naxos, Paros, Syros etc — for cheaper travel & less crowds. Excellent put up, very informative. I wonder why the opposite specialists of this sector do not notice this. You must proceed your writing. I am sure, you have a huge readers’ base already!|What’s Going down i am new to this, I stumbled upon this I’ve found It positively helpful and it has aided me out loads. I hope to give a contribution & assist other customers like its helped me. Great job.